The historic Annisquam Village Church presents Fado singer Ana Vinagre and her ensemble in an evening of Portuguese Fado music, Saturday, July 23, at 7:30 A traditional folk ensemble accompanies Vinagre on these folk “Songs of Fate” full of passion, pathos, and humor. Viriato Ferriera plays viola, Jose Silva is on Portuguese guitarra, and Peter Pimental on bass. Ana Vinagre was born in the small fishing village of Figueira Da Foz, Portugal. Following in the footsteps of her sister, mother, and grandmother, she began singing fado professionally at the age of 13 as a member of her local folk dance group, Cantarinhas de Buarcos. Vinagre toured extensively with this group throughout Europe, until immigrating to the United States with her husband and singing partner, Jose, in 1972. Today, she is one of the area's best known and most respected fadistas. Vinagre performs regularly in the Portuguese community for various community and private events, as well as at festivals and other events for a wider audience. She has appeared at the 2002 National Folk Festival, the Northwest Folklife Festival in 2003 and 2004, and a number of times in the Lowell Folk Festival. 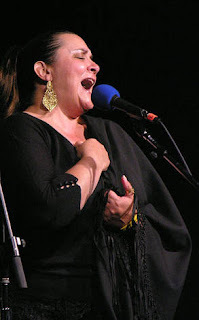 In 2005 she won a Massachusetts Cultural Council Artist Grant in the Traditional Arts, supporting her continuning efforts to promote Portuguese music and culture. A tradition dating back hundreds of years, fado singing is "the soul of the Portuguese people", as described by Vinagre. The emotional core of the fado is saudade, an indefinable yearning or nostalgia for love, times past, or a lost home. Accompanied by a twelve string Portuguese guitar and a bass guitar, the voice of a true fadista embodies and expresses the soulfulness of this music tradition. The traditional fadista dresses in black and uses a shawl as a prop to accentuate the passion of her voice and words. The genre developed in the port city of Lisbon where it was performed at waterfront clubs and bars frequented by sailors and seamen. The Annisquam Village Church stands at the head of Lobster Cove at 820 Washington Street in Gloucester. Known for its fine acoustics, the series is in its 24th year, and is dedicated this season to the memory of Houston/Annisquam artist, Colin Kennedy.